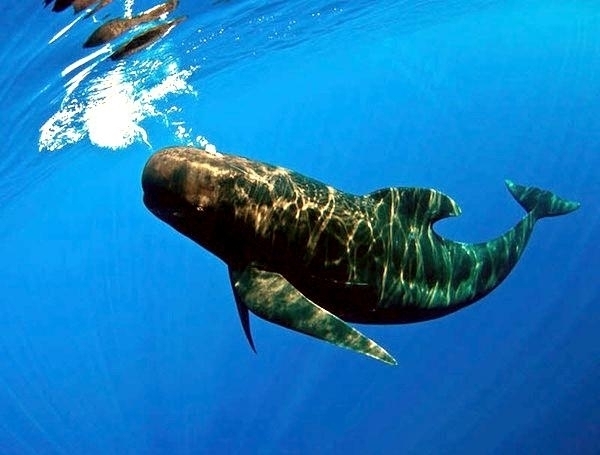 The Long-finned Pilot Whale has a large, bulbous forehead and a long, robust body which can measure up to 6.3 meters in length. 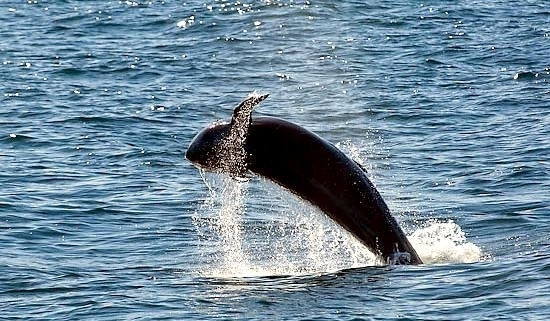 The prominent dorsal fin is wide at the base and has very long, tapered pectoral fins that can measure about a quarter of the body length. 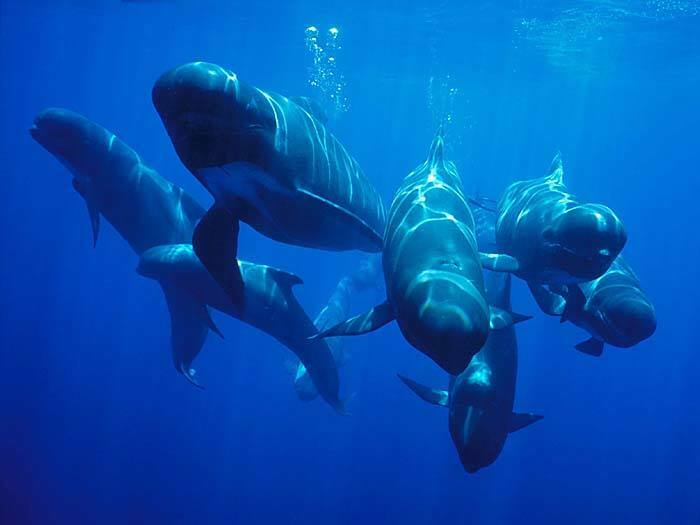 Long-finned Pilot Whales get their name from the original belief that there was a “pilot” or lead individual in their groups. 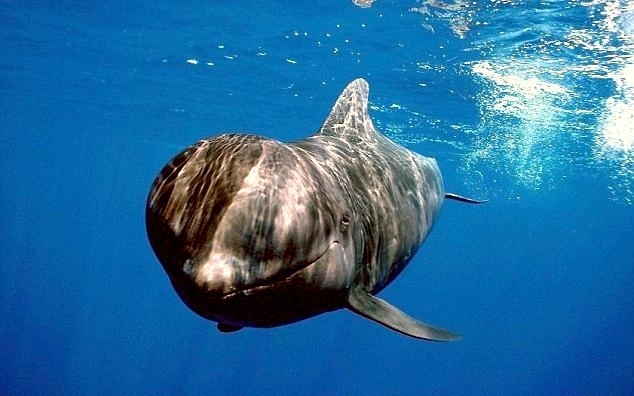 The name for the genus, “Globicephala” is derived from a combination of the Latin words globus (“globe”) and kephale (“head”). 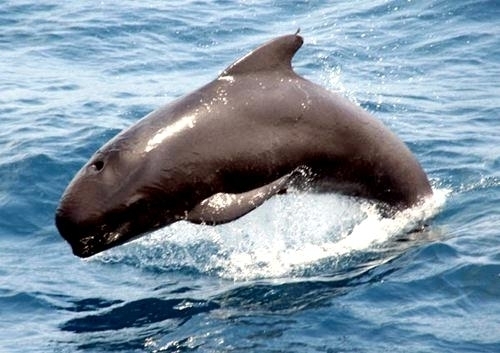 The specific name “melas” is Greek for “black”. 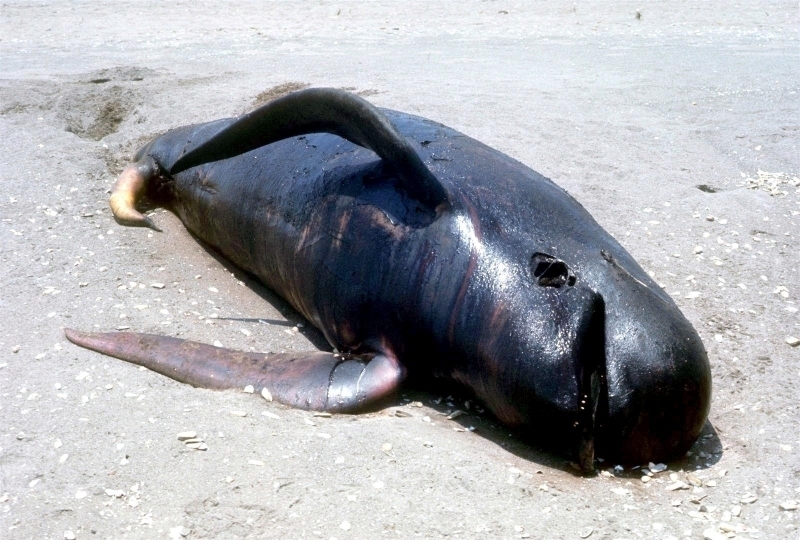 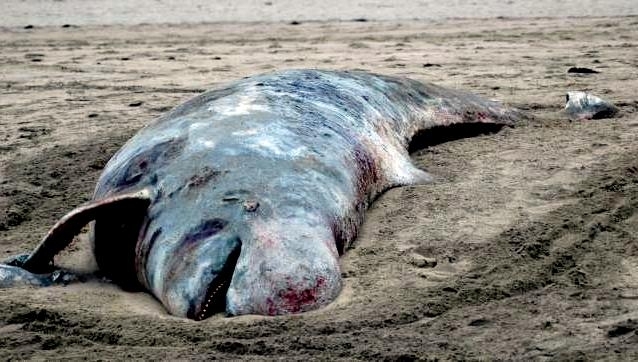 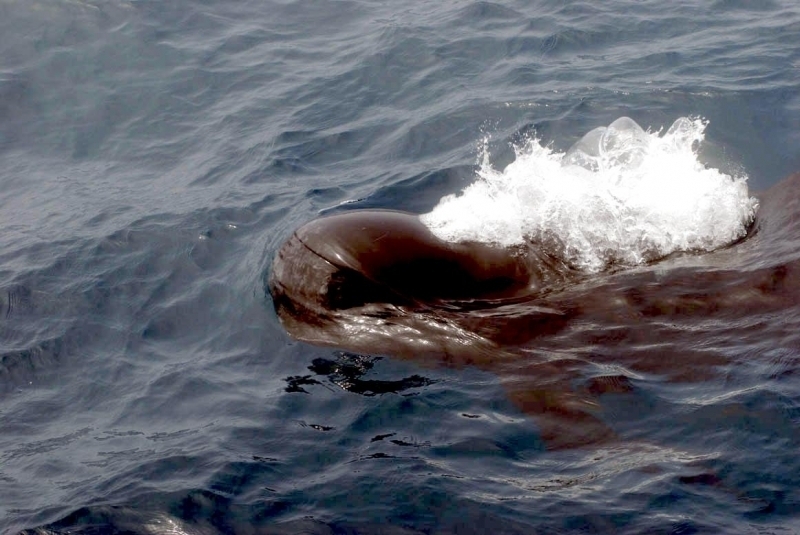 This species has also earned the nickname of “Pothead Whale” in some places because the shape of its head reminded early whalers of black cooking pots. 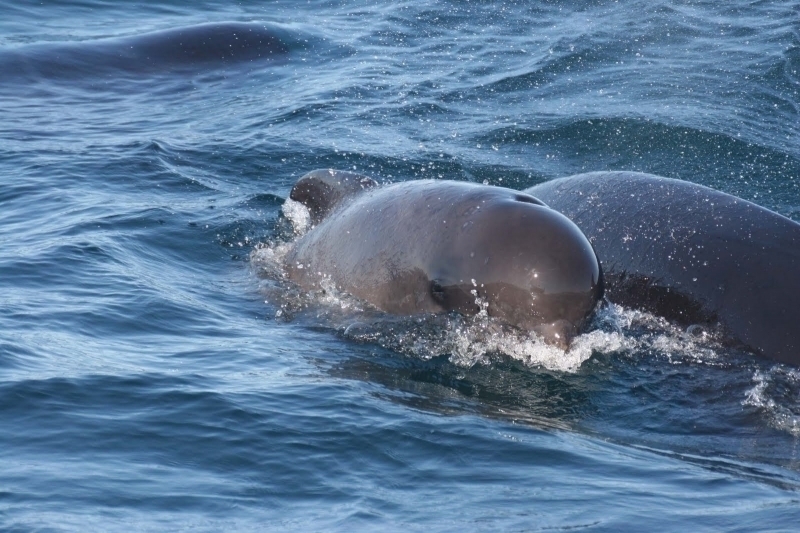 Males are usually much larger than females and they commonly have a more hooked dorsal fin and the melon may overhang the short beak. 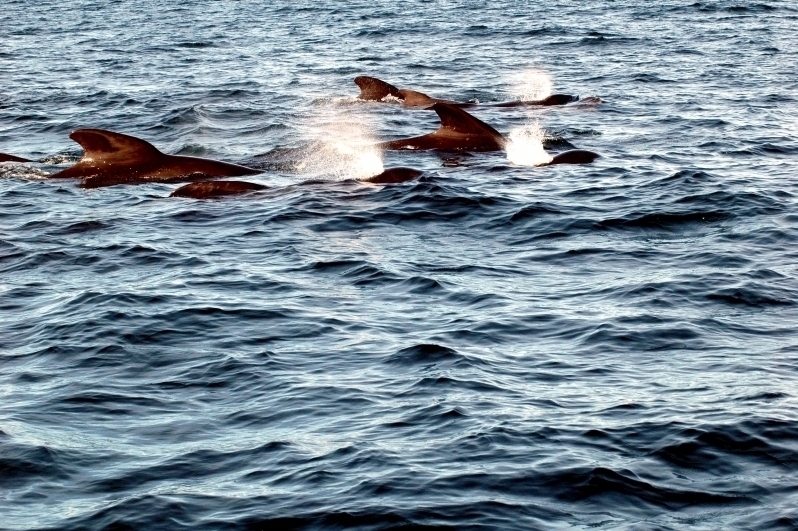 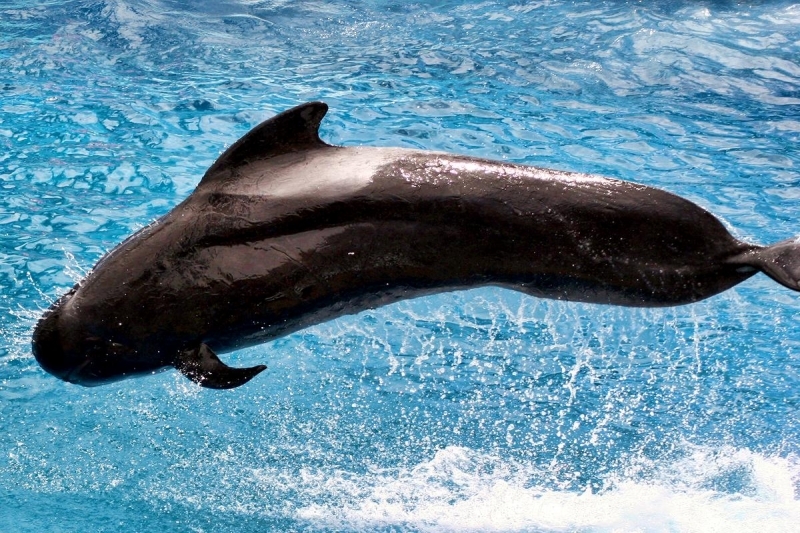 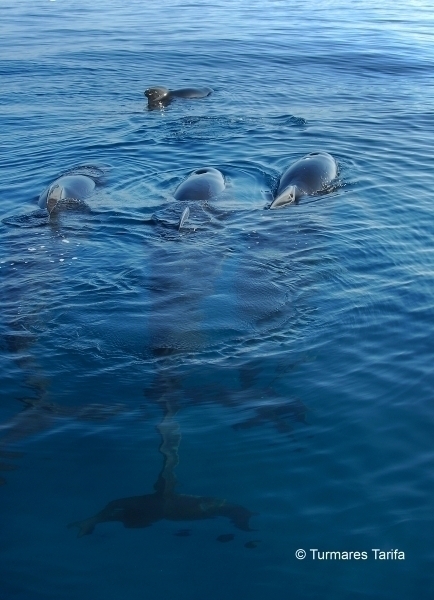 Long-finned Pilot Whales are mostly black or dark grey. 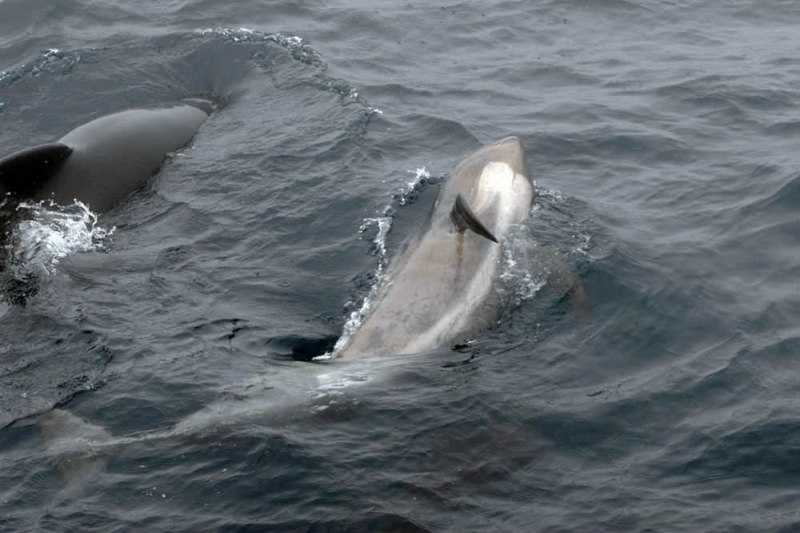 A light-colored saddle-patch is usually present behind the dorsal fin on Northern hemisphere animals. 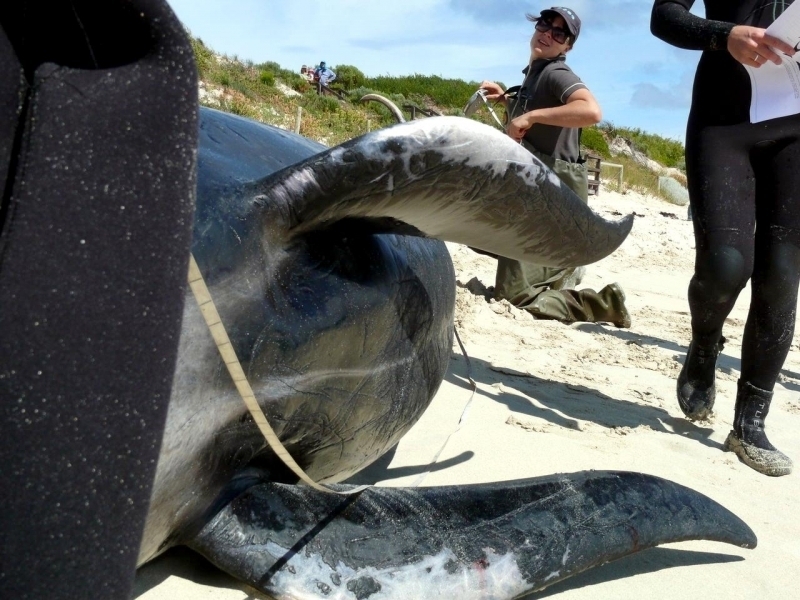 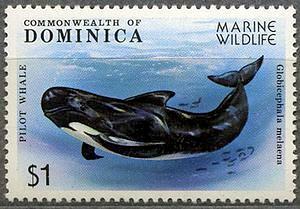 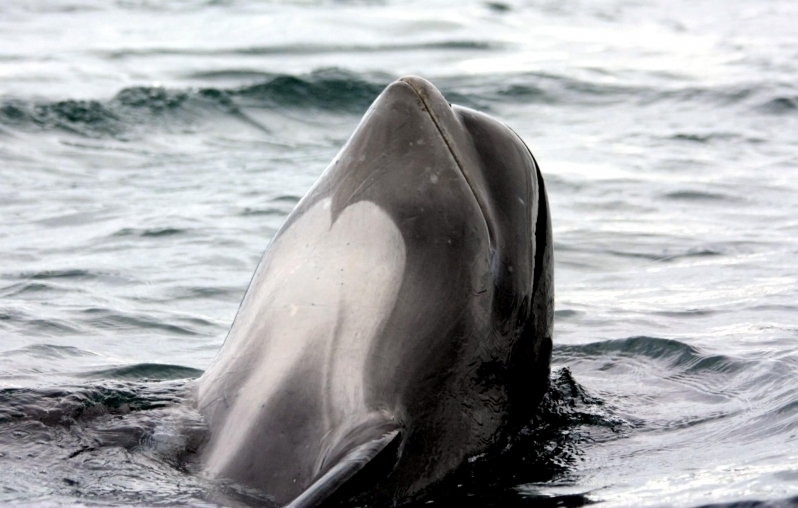 There is a light grey anchor-shaped marking on the chest which extends as a narrow stripe down the belly. 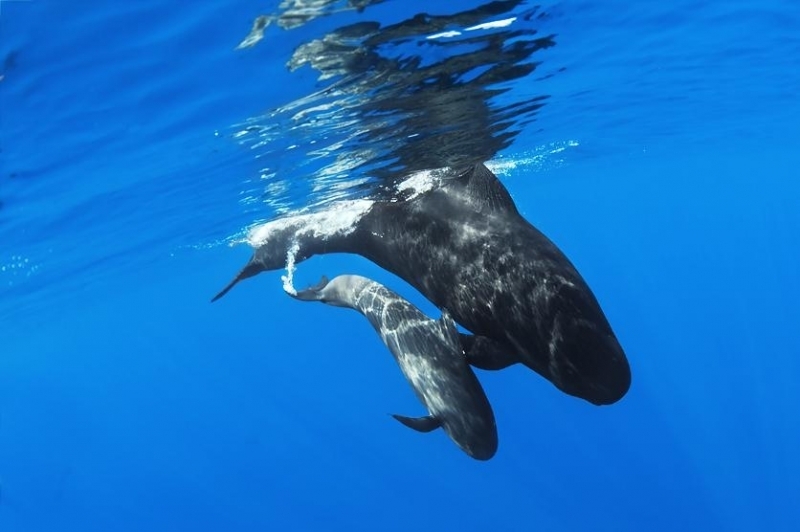 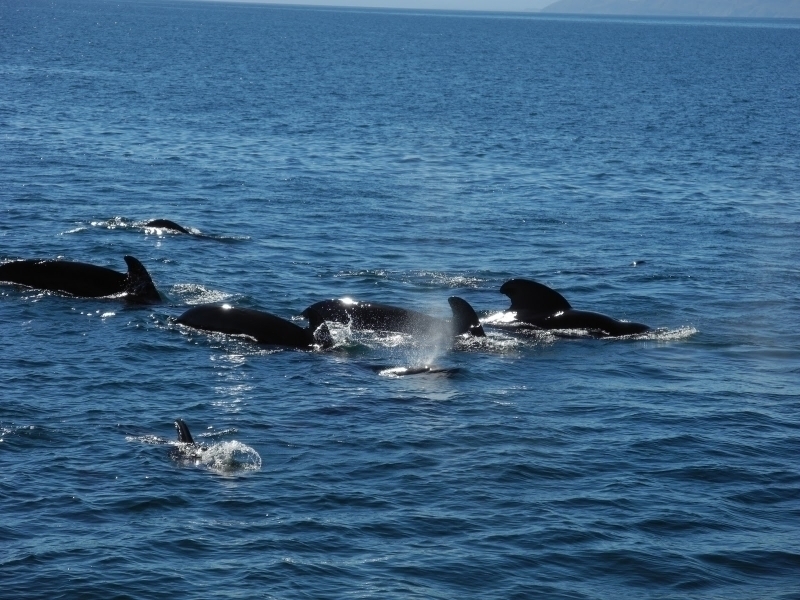 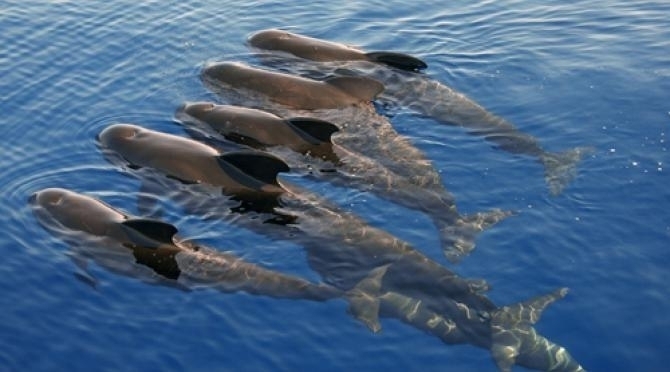 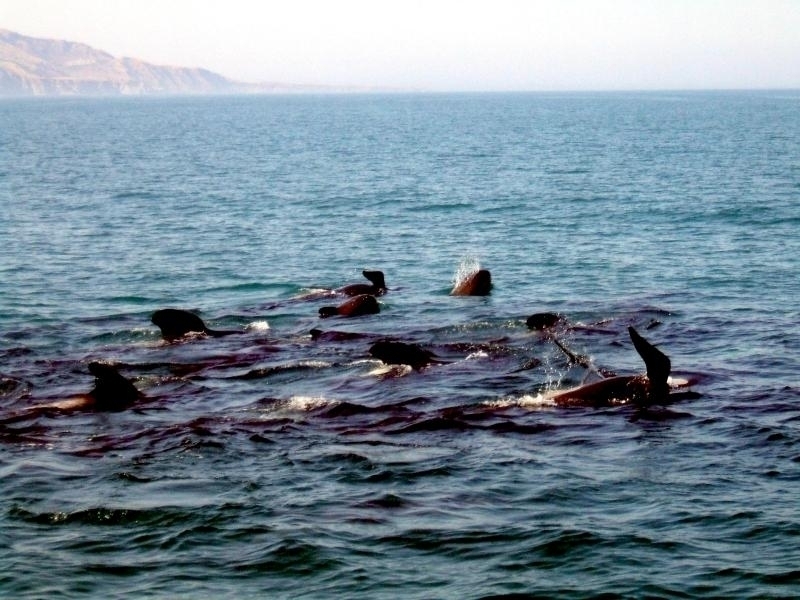 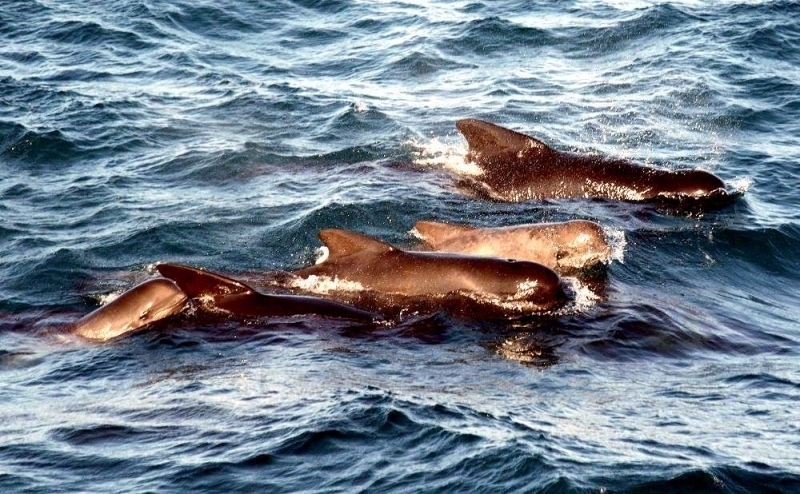 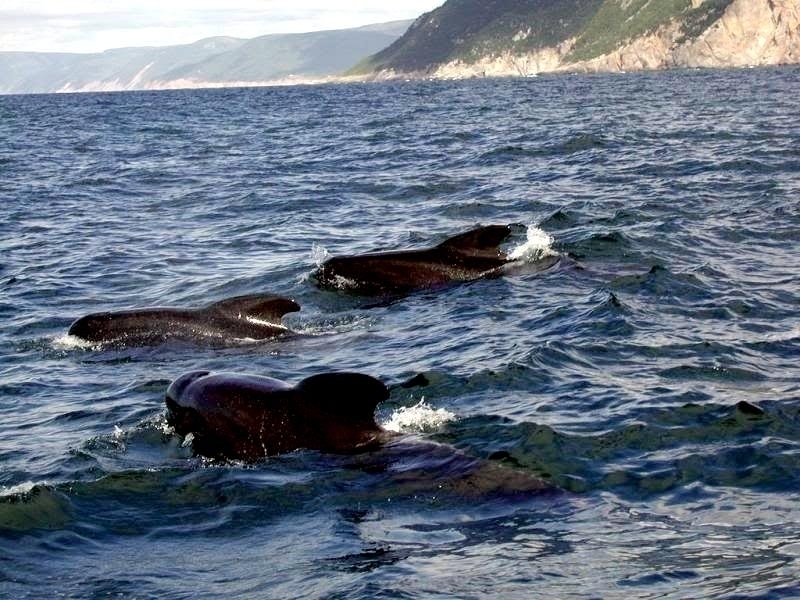 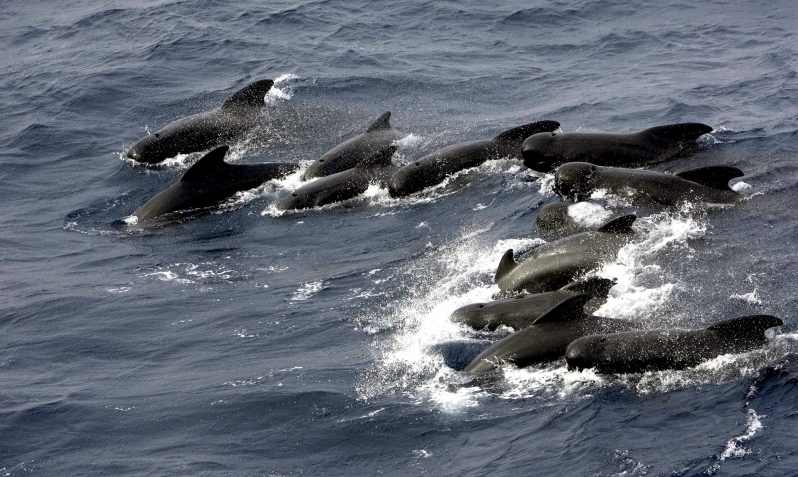 Long-finned Pilot Whales are highly social animals that have been recorded in pods of just a few animals to aggregations of over 1,000 individuals. 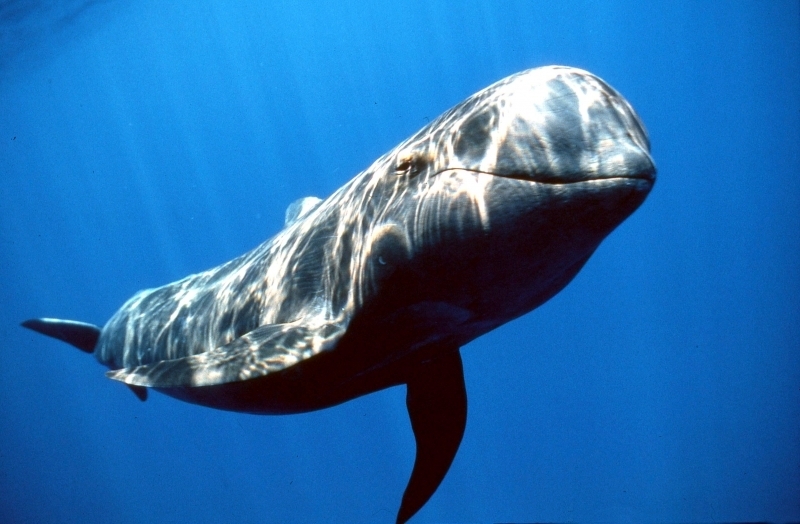 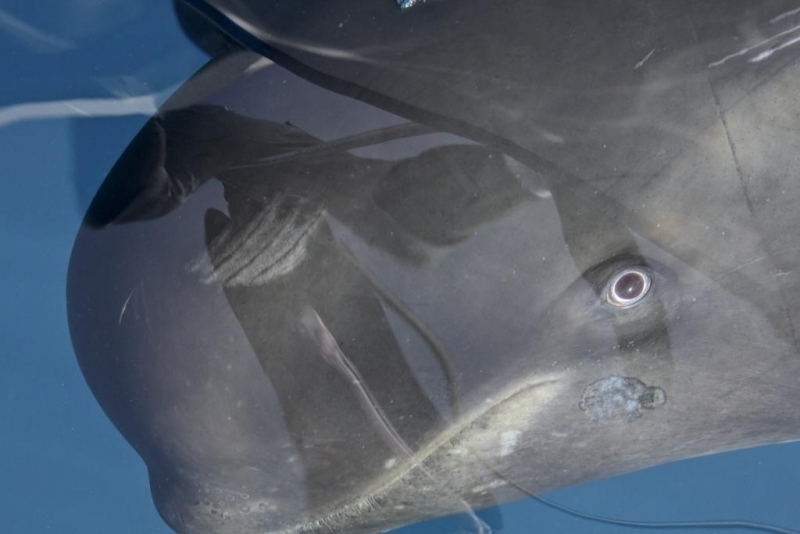 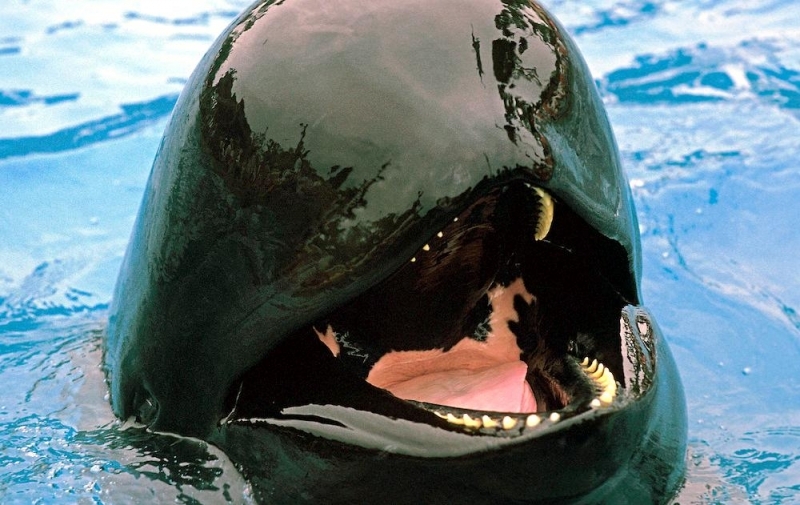 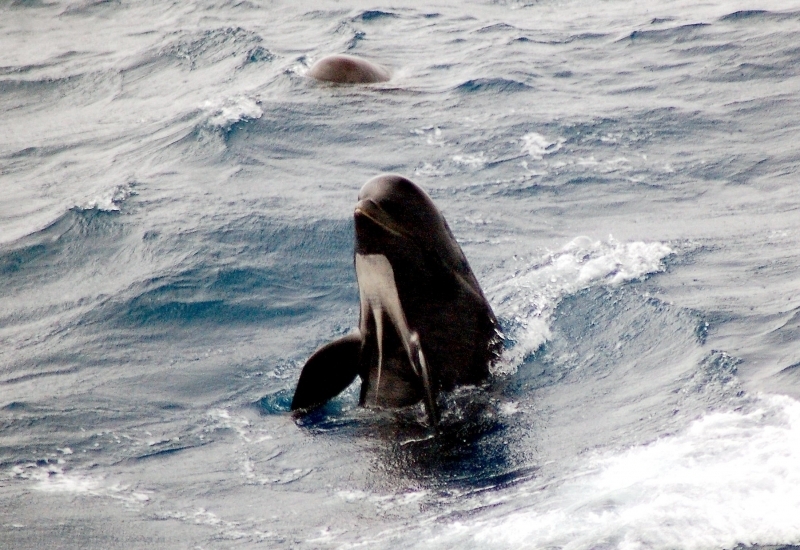 In the areas of overlap, the Short-finned Pilot Whale is difficult to distinguish from the Long-finned Pilot Whale. 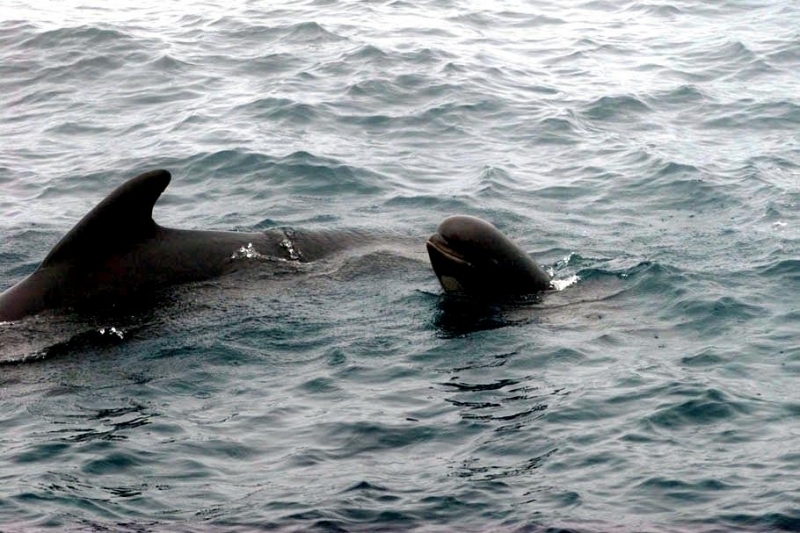 Morphological differences between the 2 species include pectoral fin length and differences in skull shape and number of teeth, but these differences are subtle and the 2 species cannot be reliably distinguished at sea. 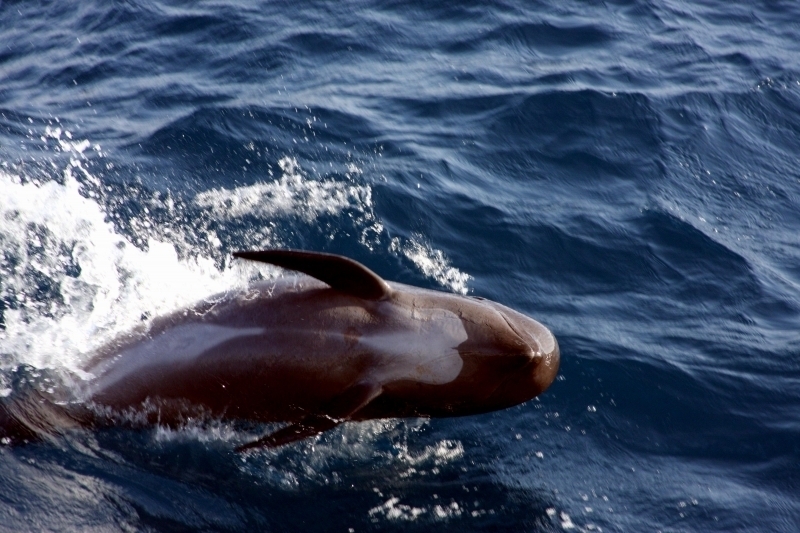 Most sightings can be tentatively assigned to species based on the geographic location. 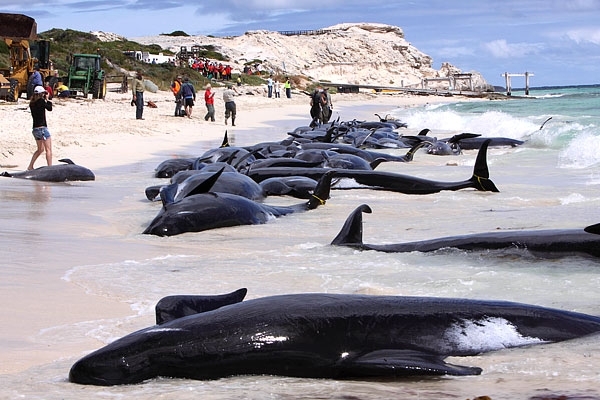 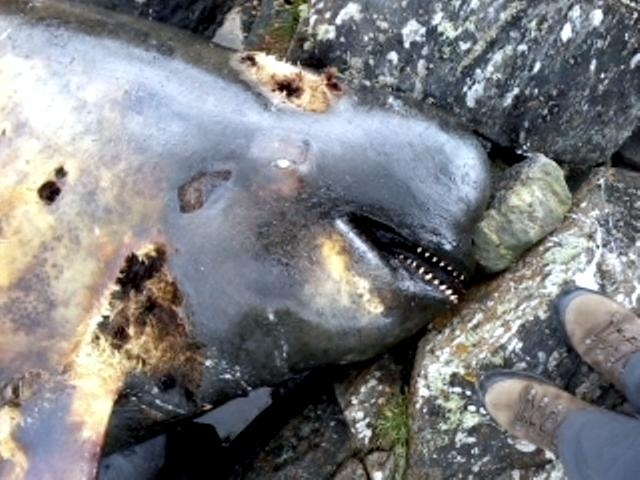 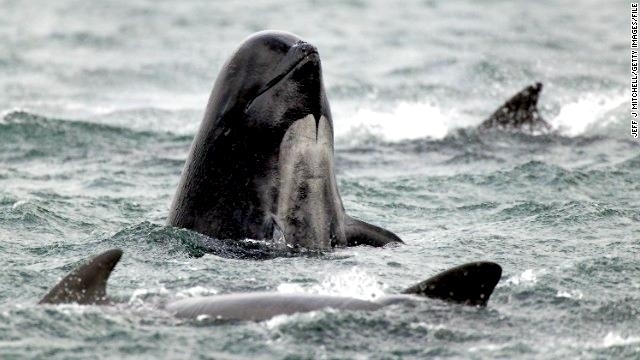 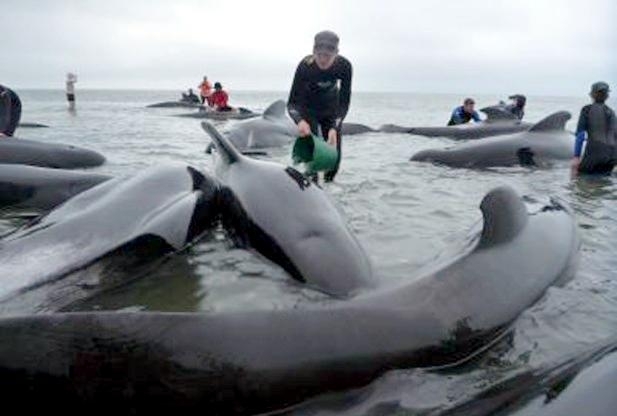 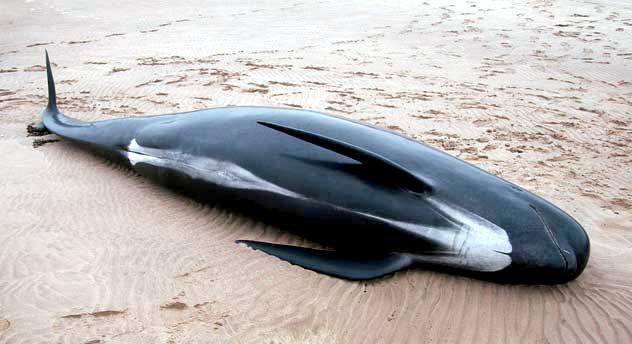 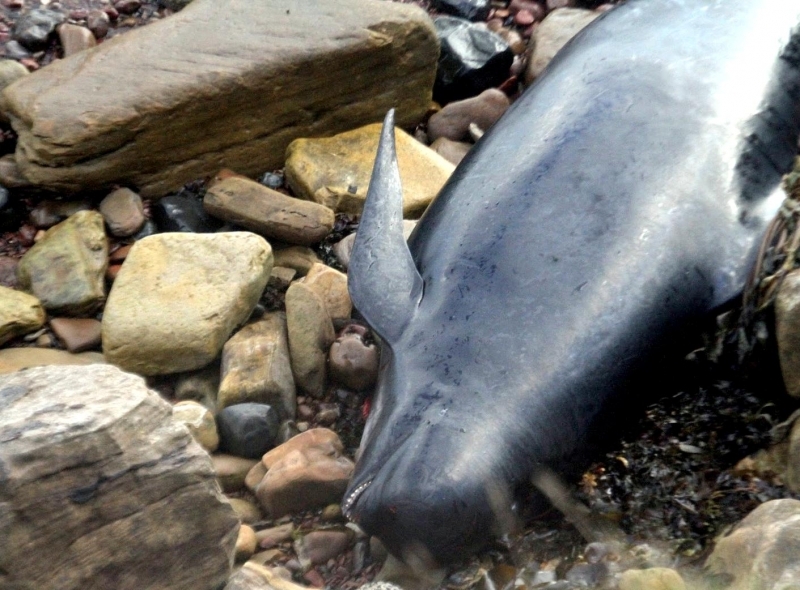 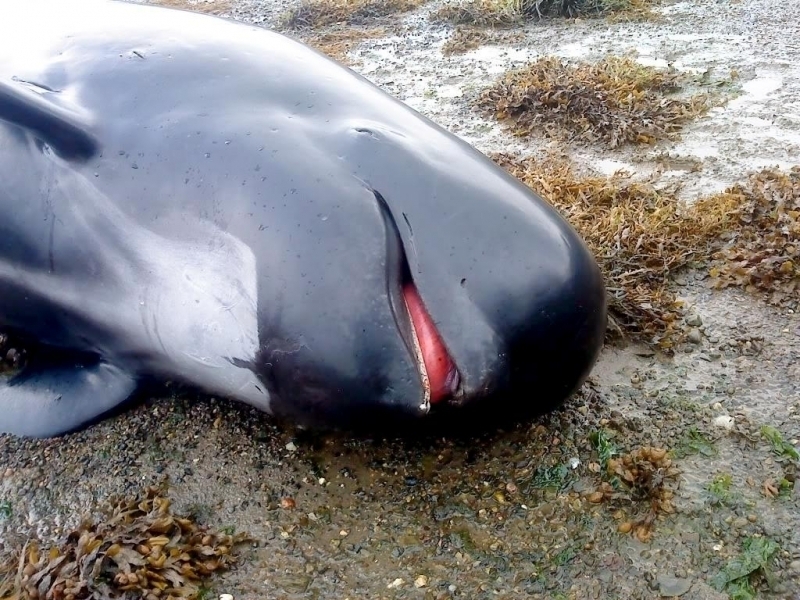 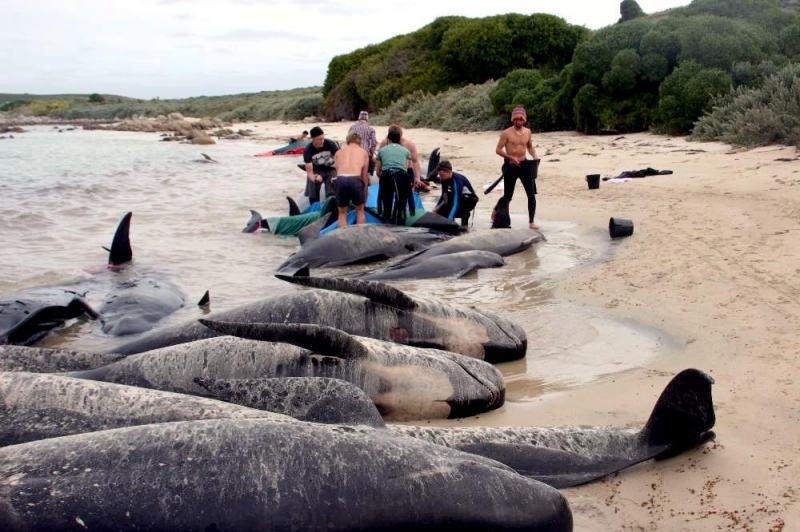 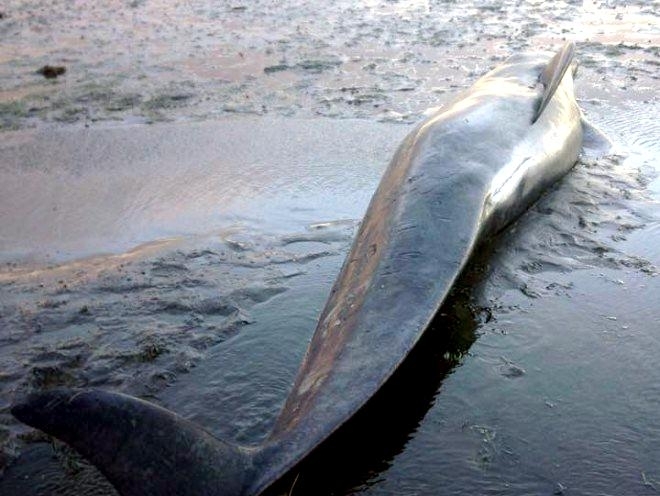 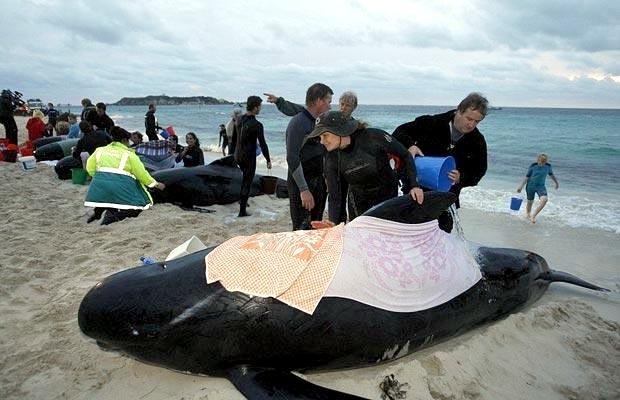 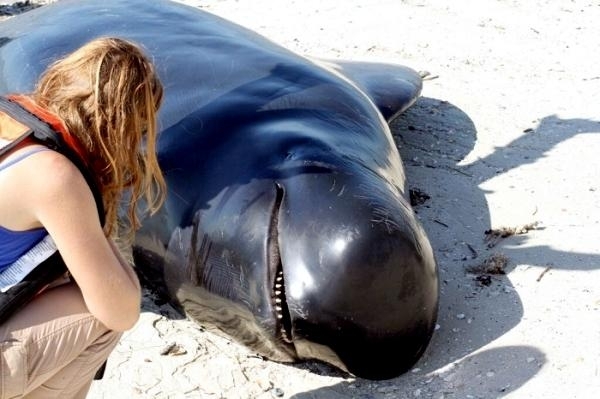 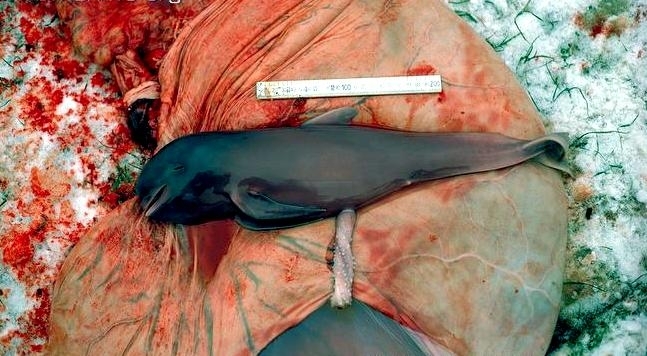 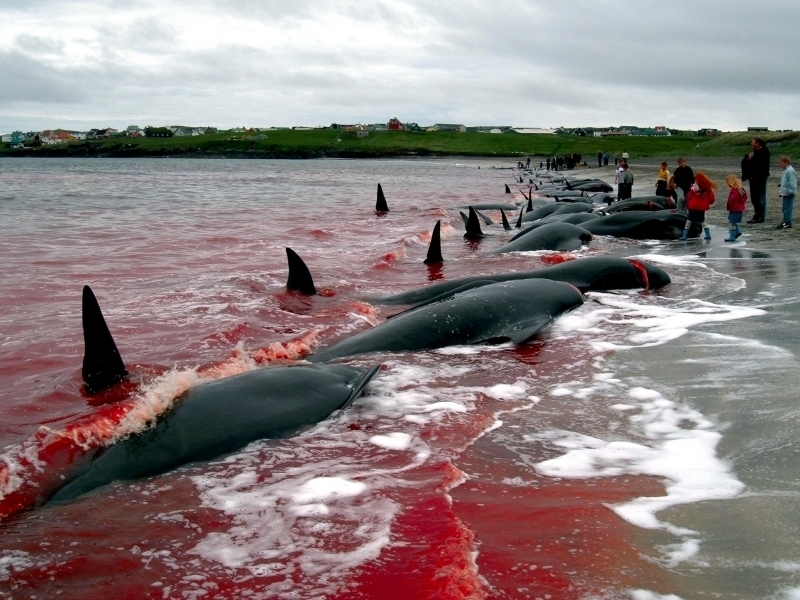 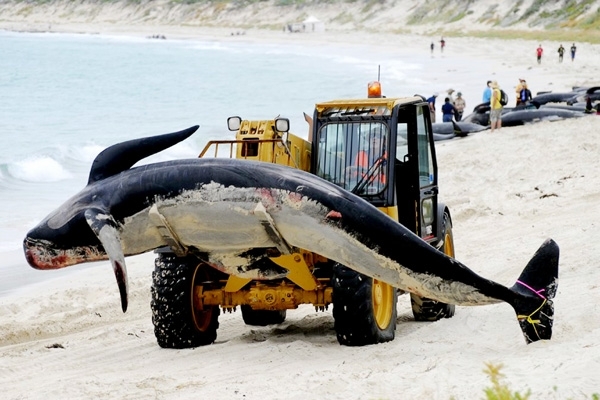 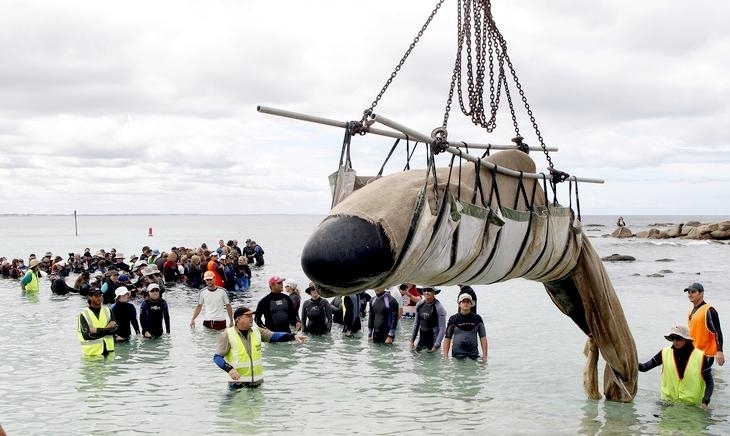 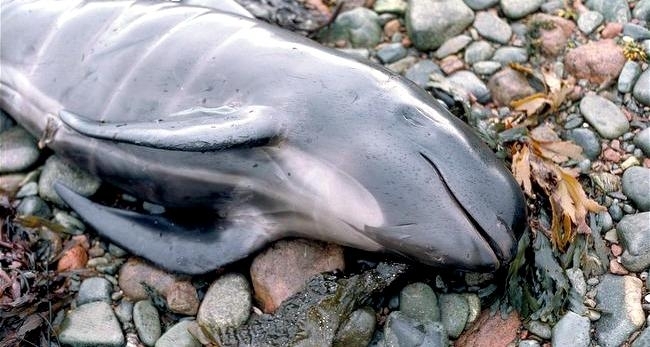 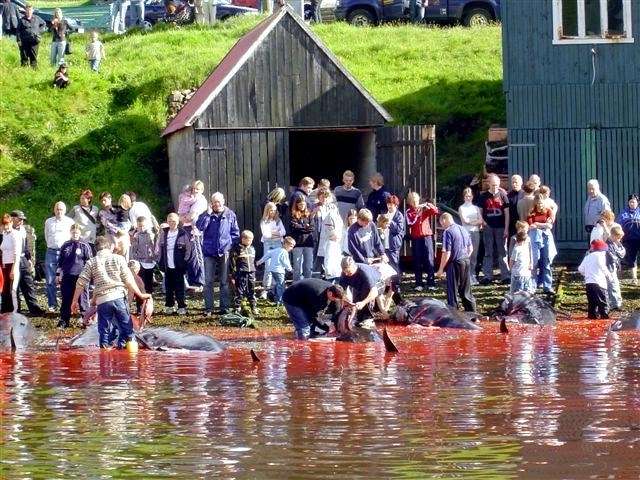 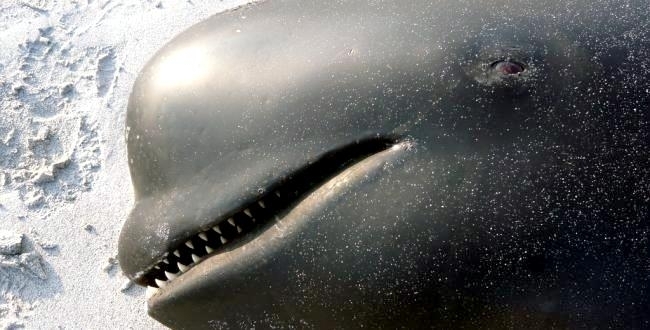 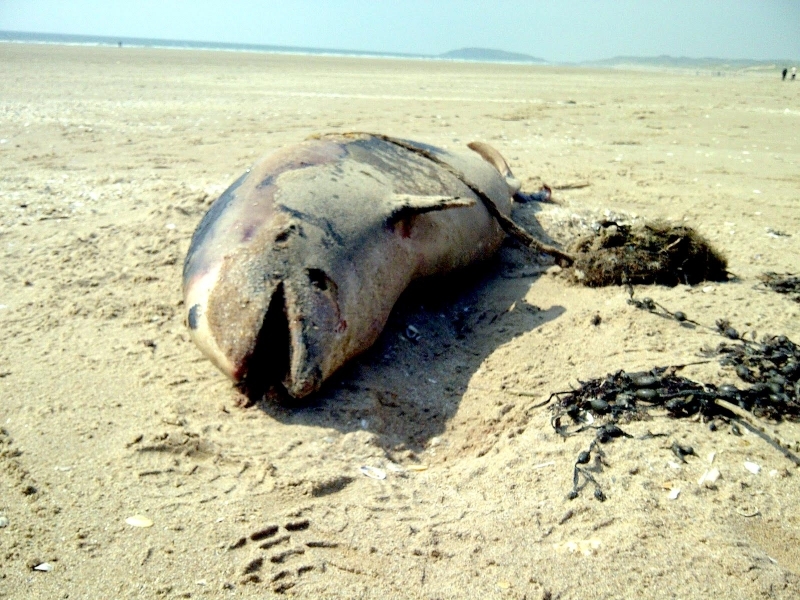 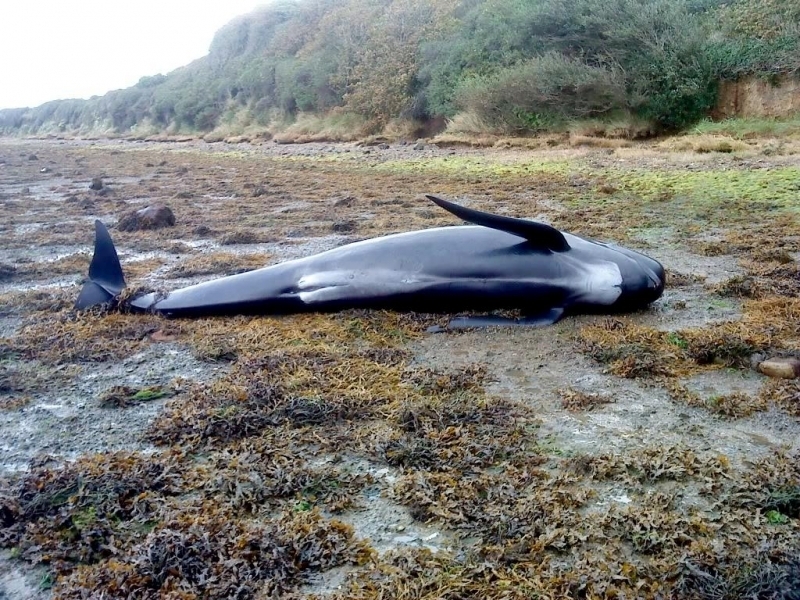 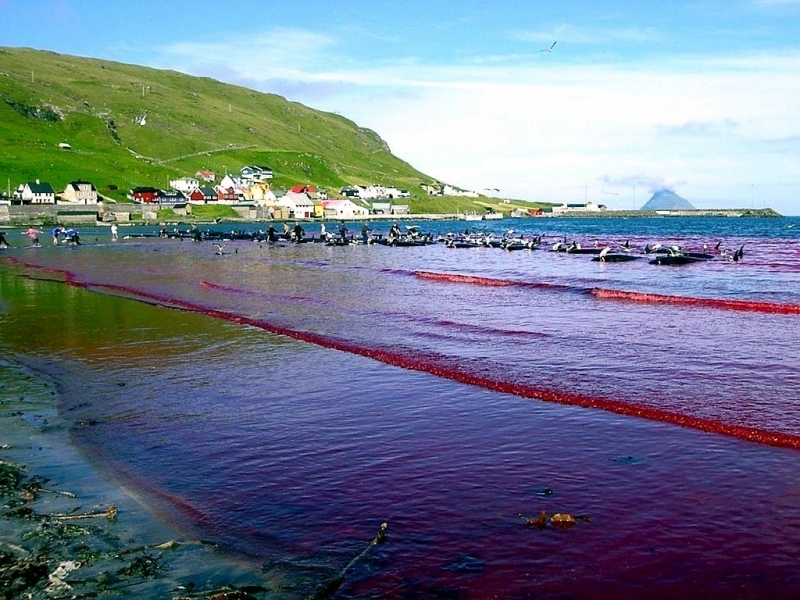 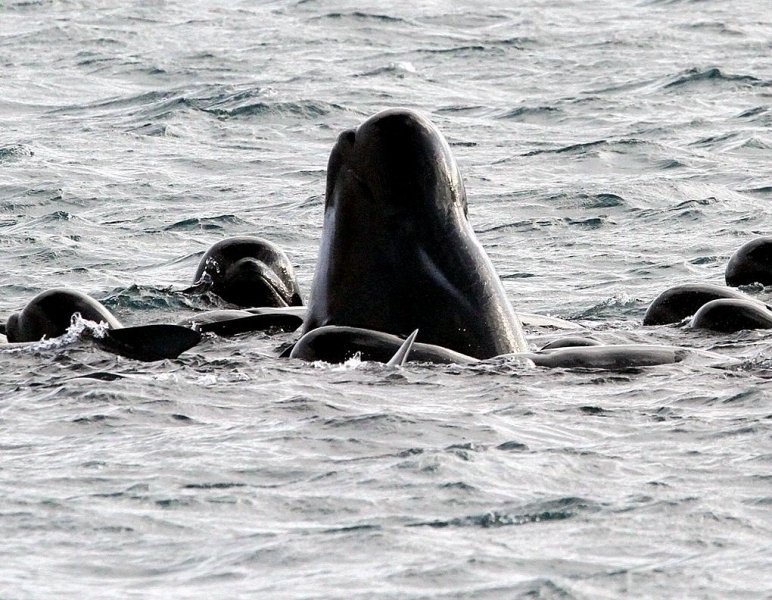 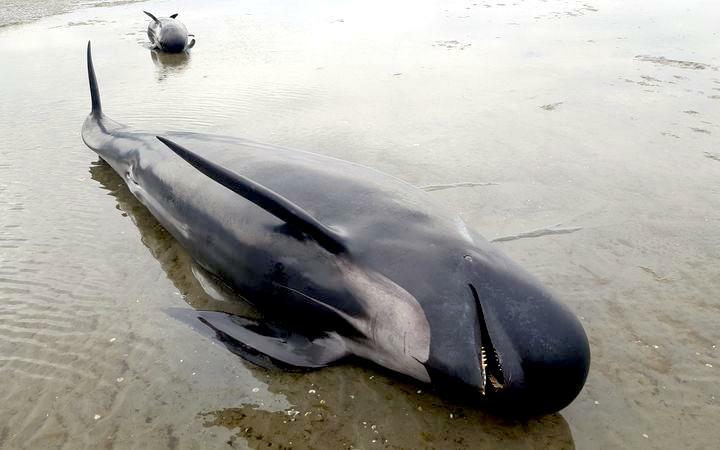 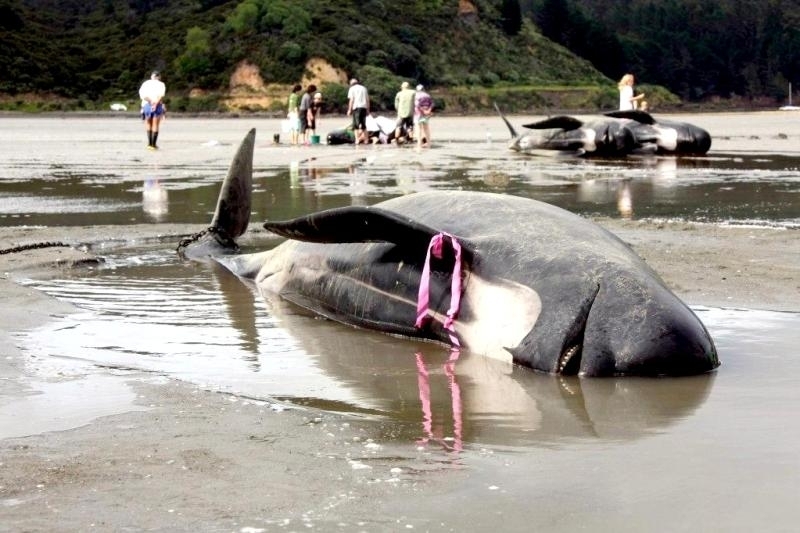 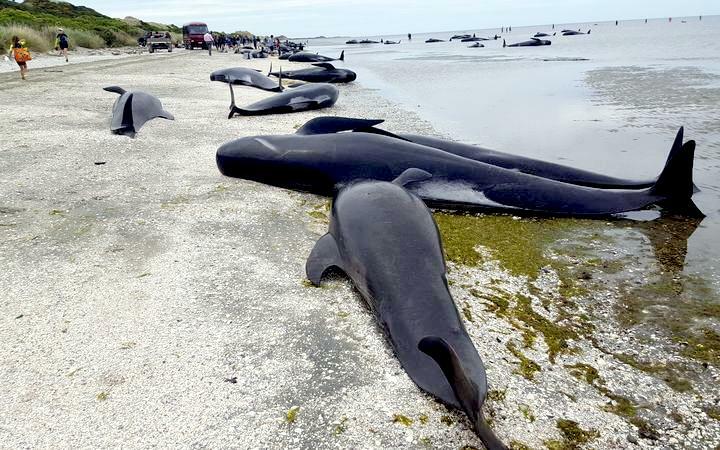 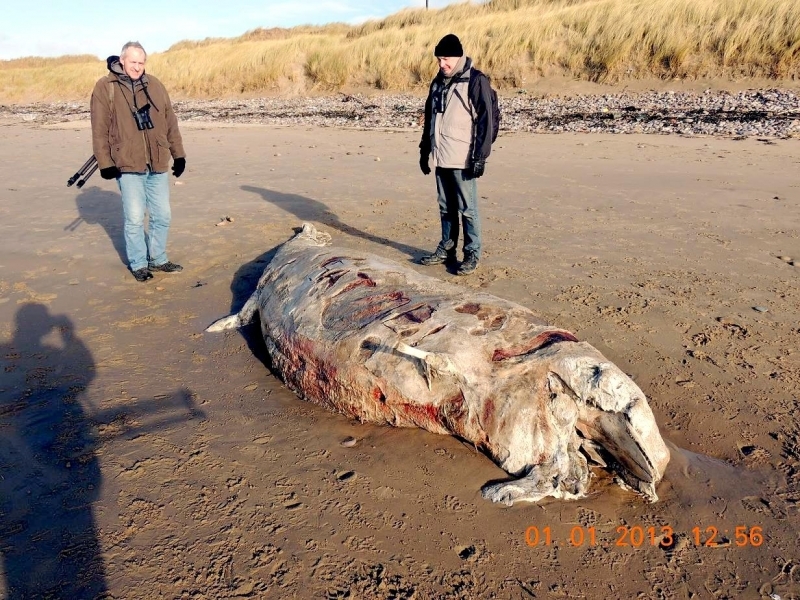 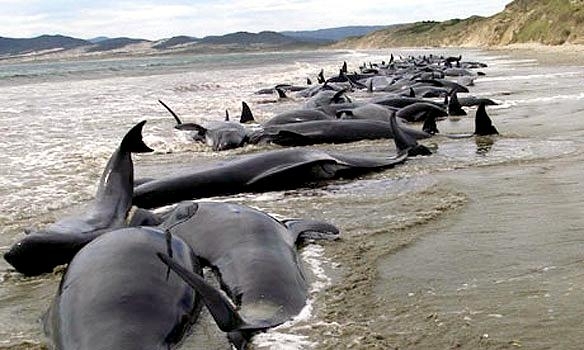 Long-finned Pilot Whales are known for their mass stranding behavior; one such event involving 531 animals occurred on the Isle of Lewis in 1992. 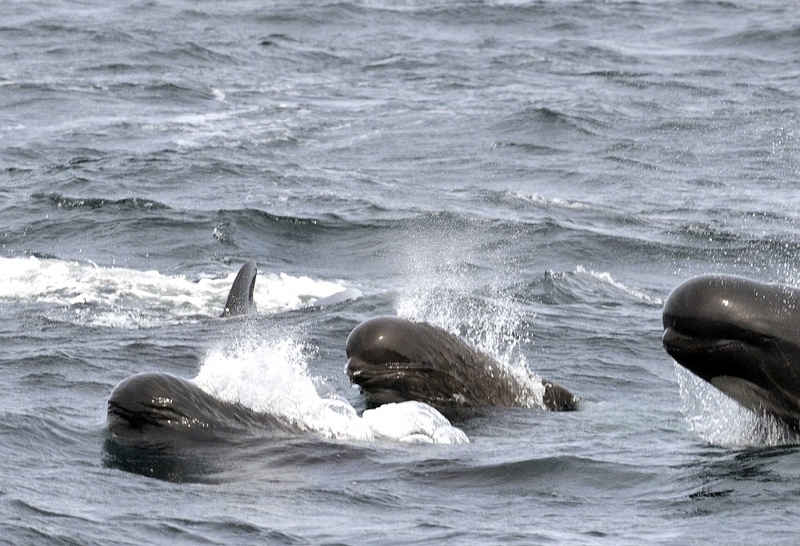 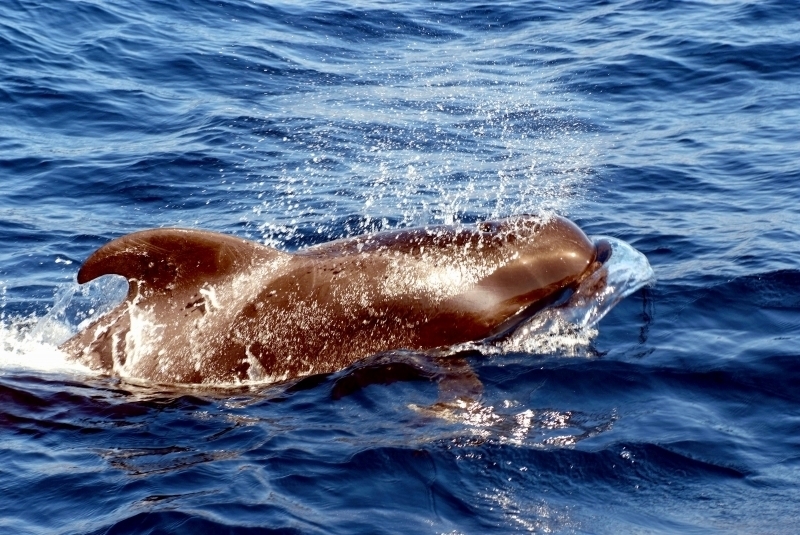 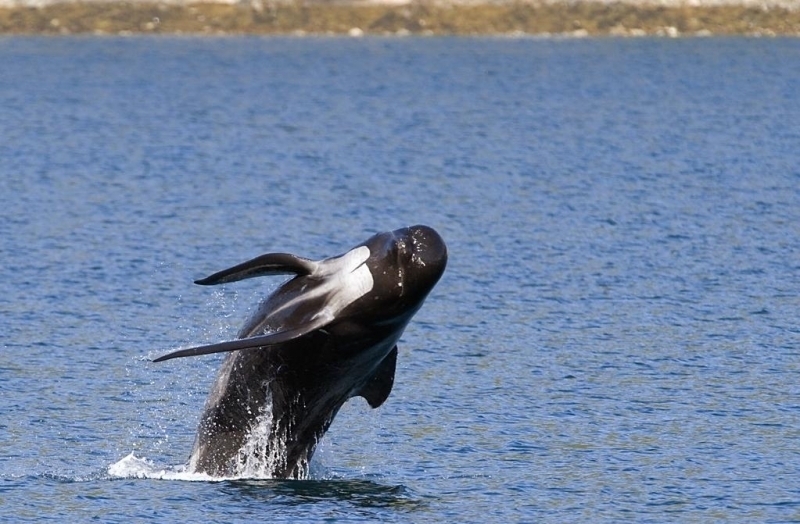 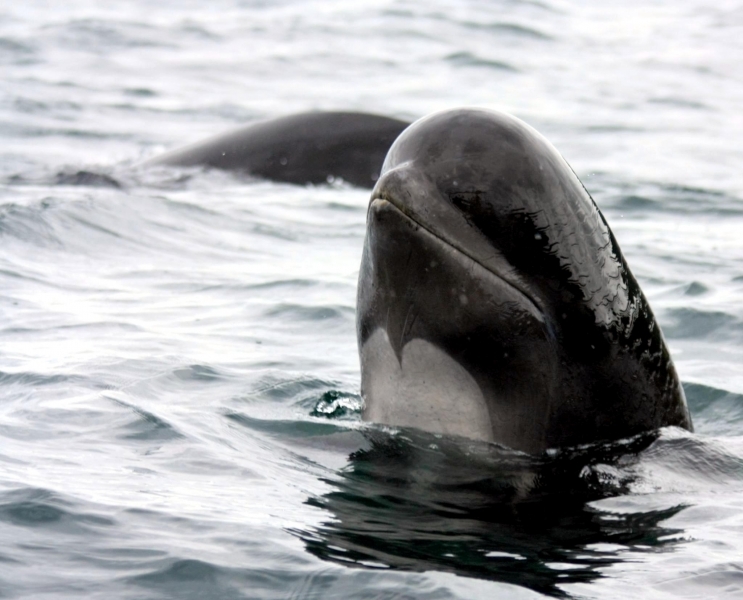 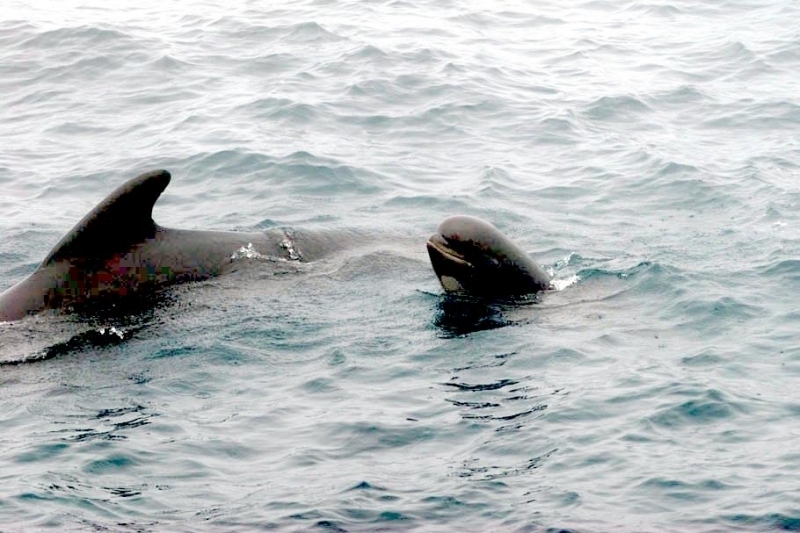 Long-finned Pilot Whales occasionally bow ride, tail slap and spy-hop (raise the head vertically out of the water) although they are often encountered resting motionless at the surface. 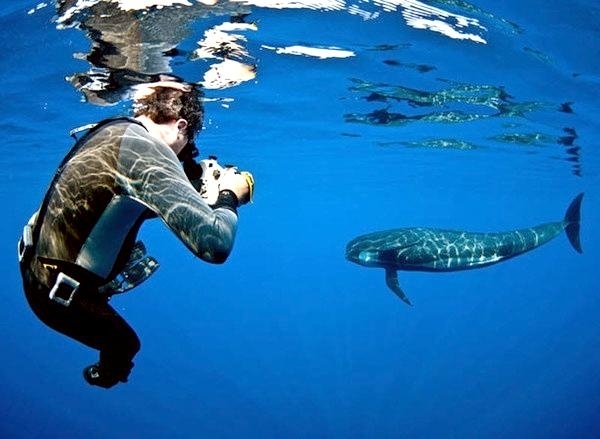 Diving to depths of between 30 to 500 meters, they hunt for squid but may also feed on fish, small octopus & shrimp. 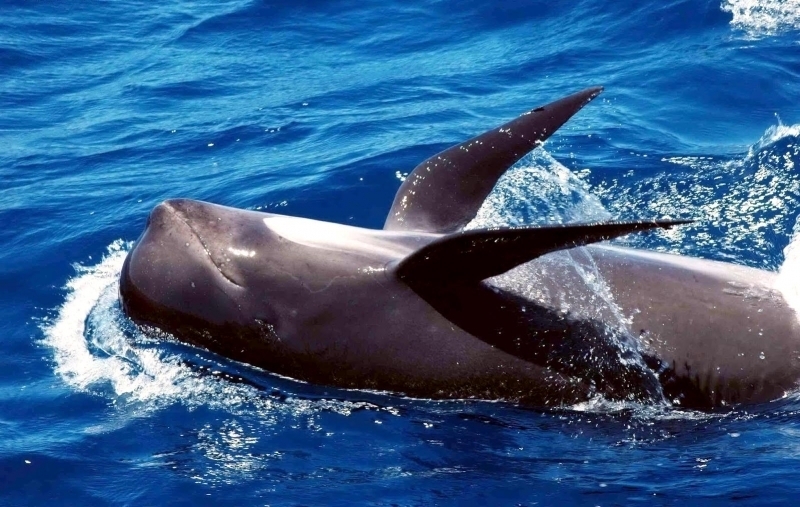 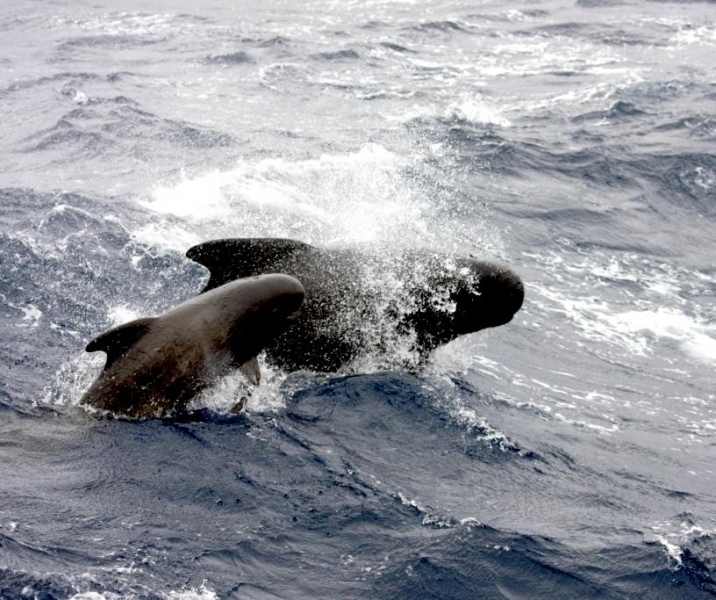 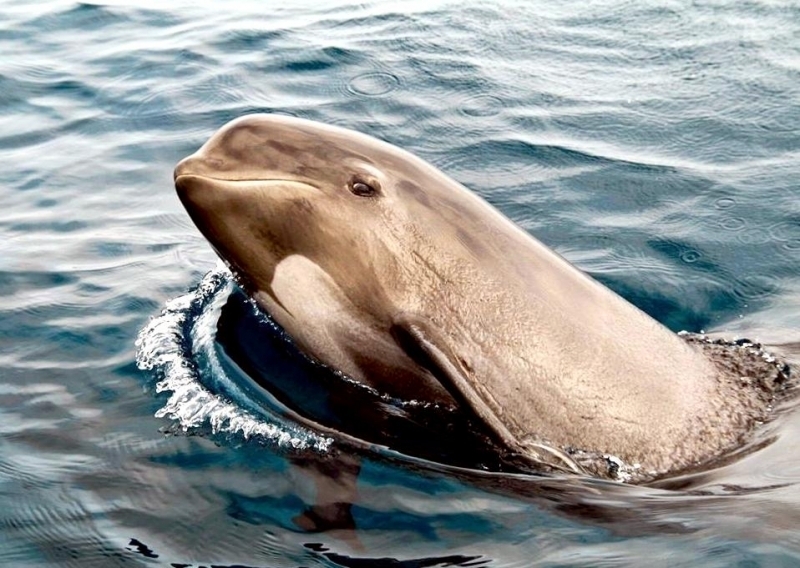 There are 2 separate sub-species of Long-finned Pilot Whales: in the Southern hemisphere they occupy a circumpolar distribution in cold sub-Antarctic waters; in the Northern hemisphere their range is restricted to the north Atlantic Ocean, the North Sea and the western Mediterranean from the Azores to Greenland. 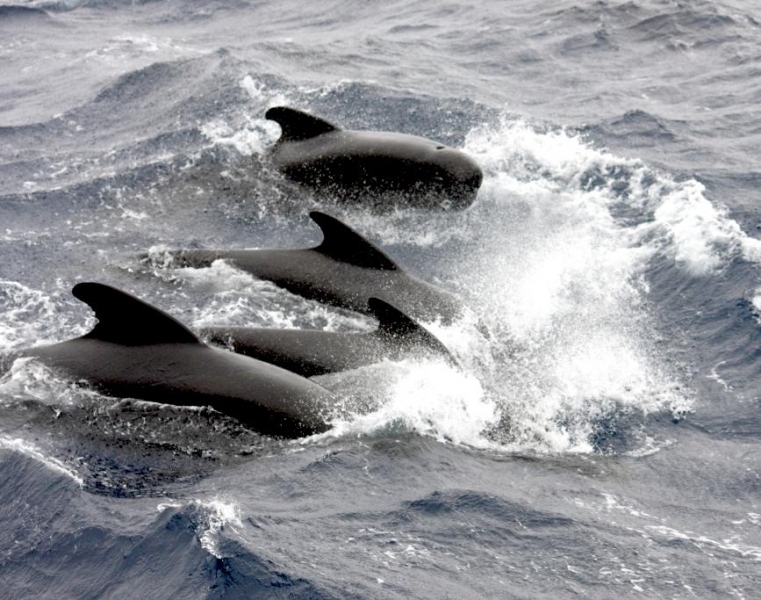 They favor deep waters, although their seasonal movements may reflect prey distribution. 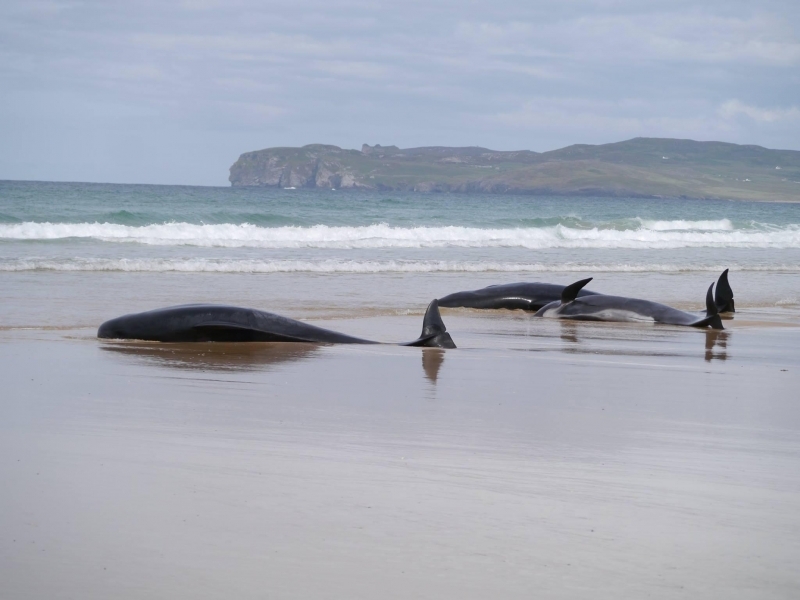 Sightings in the Hebrides are widely distributed and they are also the most commonly stranded species here.